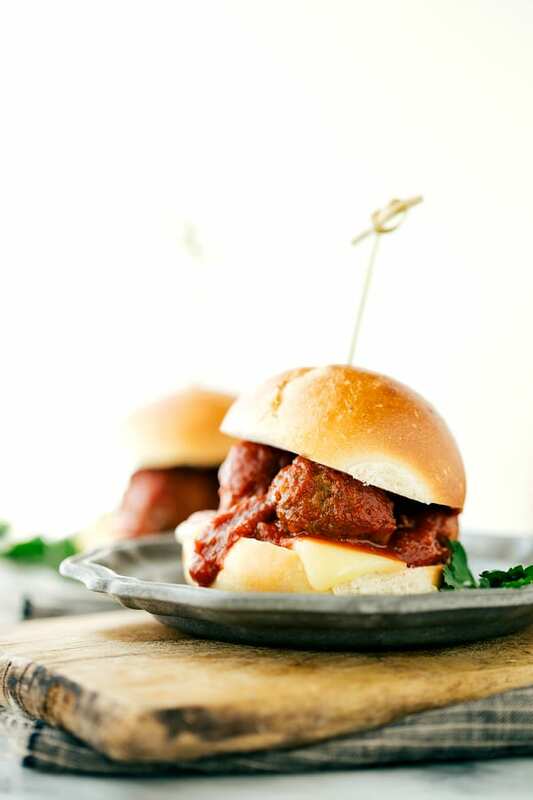 Slow-cooked miniature Italian meatballs perfect to make meatball sliders, meatball subs, top a pizza/salad/pasta…the possibilities are endless! I can’t believe the big game is TOMORROW! I’ve been talking about prepping the food part of it for over a month now. Remember when these cute football granola bars were shared?! So, I’ve got to know…are you rooting for the Broncos or Panthers? Or….just there for the good food? I’m in the third category which you probably already know. And I’ve got one last recipe for you to consider (DO IT!) making for the game. 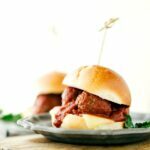 These little meatball sliders were a huge hit at my home. Both for the flavor and taste (my boys could not get enough of them) and for the ease (Crockpot!). Although we should get this out in the open right away: this isn’t an entirely made-in-the-crockpot meal. Because you will need the oven for a minute. (Or 6 minutes to be exact.) These meatballs do get a quick broil to help them retain their shape and moisture so they don’t turn into a meat-sauce in the crockpot. So why not just cook them all the way in the oven? 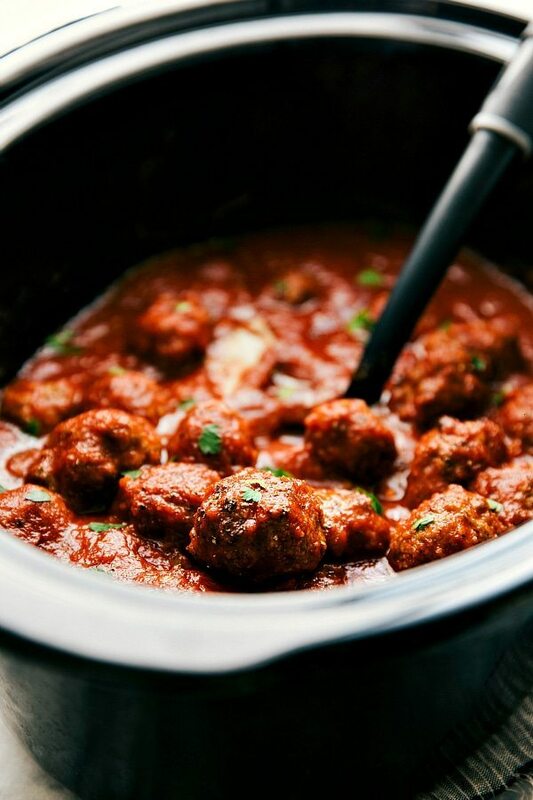 Honestly, the crockpot makes for thee most tender meatballs and it really allows time for all the flavors to meld and become ultra delicious. The meatballs are very quick to throw together and require minimal ingredients making them fast and simple. The sauce is also just a few easy ingredients thanks to the pasta sauce which forms the base. SO, just in case you don’t need 60 miniature meatballs because there is no party on the horizon, you should still make the full recipe because these freeze super well! And then it’s like meatballs ON DEMAND which is amazing. Especially because these meatballs are so versatile. Since we haven’t thrown a game day party, let me just tell you how we’ve used the meatballs in the fridge so far; they’ve gone on sliders, subs, and on top of a bed of pasta. I plan on making some brown rice to serve these on and perhaps even a pizza this weekend! So many things you can do with this recipe! 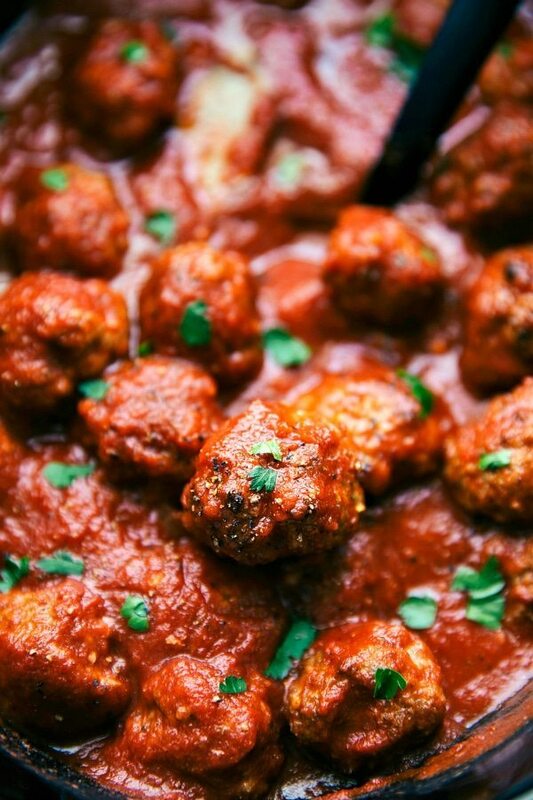 Slow-cooked miniature Italian meatballs perfect to make meatball sliders, meatball subs, top a pizza/salad/pasta...the possibilities are endless! In a large bowl, combine the ground beef, milk, eggs, breadcrumbs, Parmesan cheese, minced garlic, and about 1 teaspoon seasoned salt and 1/4 teaspoon pepper. Knead the mixture with your hands until all the ingredients are well combined. Move your oven rack to 4 inches from the top and set your oven to broil (550 degrees F). Line a large tray with foil and spray generously with nonstick spray. Form small meatballs (1 inch in size) until you have 60 meatballs. Broil in the oven 3 minutes on each side. This helps to keep in the moisture and cook evenly in the crockpot. Add half of the meatballs to the crockpot. Cover with pasta sauce, minced garlic, bay leaf, Italian seasoning, onion powder, and about 1/4 to 1/2 teaspoon each of seasoned salt and pepper. Add remaining meatballs. Very gently stir until all the meatballs are coated in the sauce. Add 2-3 tablespoons freshly chopped parsley if desired. Cover and cook on low for 4-6 hours. High setting not recommended. When ready, slice buns in half and add a few slices of mozzarella cheese (or grate it and top the meatballs with it!) add the meatballs and enjoy. OR if desired, broil the meatball sliders/subs 4 inches away from the top for about 30 seconds. Absolutely delicious for such an easy step! 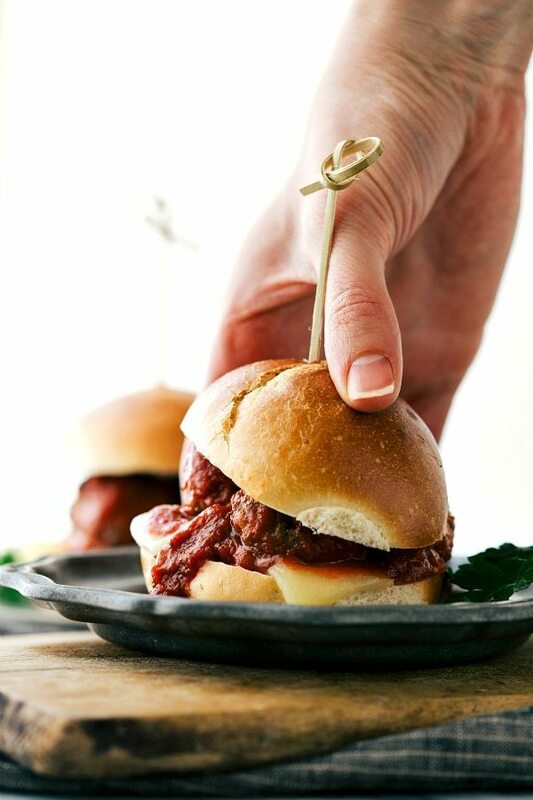 🙂 Buuuut these are easy meatball sliders so you choose!